Two beloved Portuguese dressings: a chouriço-bread dressing with spicy sausage, onions, garlic, crushed red pepper, and paprika. Another dressing with sweet sausage, potato, butter, nutmeg, and spices. When I was growing up, Thanksgiving was part holiday, part carnival. We’d gather around the table and all the women (that’s not as sexist a remark as it may seem; it was the ’60s, after all) would become carnie barkers. Right after my grandfather finished grace, the air would explode with their babble—Hey, you, young man! How about you, little lady!—trying to coax you to step up and try their kale soup, sausage stuffing, or meringue cookies. Sides were heavily drawn along immediate family lines, until that first brave (read: foolish) cousin dared dip his fork into an aunt’s paprika-and-chouriço-roasted potatoes, and all hell broke lose. Matrilineal allegiances would drop like canaries in a mine shaft and the annual holiday season had begun. I always tried to stay true to my mother and her cooking for several reasons. 1.) She was a damn good cook; 2.) I worshipped her; and, perhaps most important, 3.) she was one hell of a force to be reckoned with when you displeased her. But on God’s sanctioned Holiest of Holy Food Days, according to a mash-up of catechism and playground philosophy, I betrayed her. Yes, her capons were impossibly juicy with taunt mahogany-burnished skin George Hamilton would envy. (Poppa Leite doesn’t like turkey, so it was emasculated roosters for us.) But she tripped up in the stuffing department—actually, I should say, dressing department because no one in my family ever stuffed a bird. Avó Costa, my maternal grandmother, and Dina short for madrinha (which is “godmother” in Portuguese), were the two reigning monarchs when it came to stuffing. My grandmother’s stuffing was bread-based and had all kinds of love in it. To wit: Day-old Vienna bread, chouriço (as you should know by now, the incomparable sausage of Portugal, whose aroma my grandmother wore like Chanel No. 5), onion, garlic, massa de pimentão (a red-pepper paste spiky with heat), wine, tomato paste, herbs, and (her favorite) white pepper. And the Portuguese voodoo that only she pulled off? Despite all that soaked bread, what should have clunked onto the table like a medicine ball was airy instead–like mashed potatoes right after you’ve whipped them into a cloud of fluff. It was a feat no one else could master. But then again, no one else had the upper-arm strength of that woman. The other stuffing that graced the table, the one that was secretly my favorite, was what Dina relished calling “French stuffing,” as she liked to downplay the 50 percent of her DNA that was Portuguese. Now stay with me here, because its provenance is quite confusing. There is indeed a dish called French stuffing—made with ground pork, potato, cinnamon, and nutmeg—that is mistakenly referred to by some as gouton, gorton, or corton, depending on where on New England’s South Coast you come from. No matter how you pronounce it, it’s actually a bastardization of cretons, a Canadian pork pâté that’s distinctly different from French stuffing. But for many, including my godmother, it was a short leap from Canadian to French Canadian to French. Hence it all was French stuffing. And to her anything French, even by way of Montréal, trumped Portuguese. But it isn’t French at all—well, at least not exclusively French. See, when I lived in Portugal a few years ago, I uncovered a touching tidbit of information, a detail that gave meaning to our table and a sense of unity to our family. 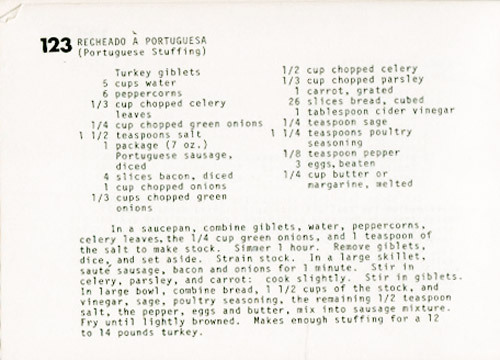 I discovered, while flipping through an antiquated cookbook in a dusty store in Lisbon, that the Portuguese make several types of stuffings to go with their turkey, none of which have anything to do with Thanksgiving, as they don’t celebrate the holiday. (Are you still with me?) One dressing is almost a fraternal twin of my grandmother’s bread stuffing. But I found another stuffing, one that is a kissing cousin to Dina’s version. So close are they that I guess you could call them French-kissing cousins. (She’d love that.) This old stuffing is plump with potatoes, pork sausage, onions, garlic, milk, a sprinkling of herbs, and—differing from Dina’s dish—the chopped and sautéed liver of the turkey. She may have called hers French stuffing, and it may have been handed down by her French-Canadian mother, but I firmly believe that her Portuguese father had a gentle influence, too. By the time I discovered this, Dina was long dead. How I wish I could have sat there, thumping the dining room table with my fist while she leaned back implacable, pulling on a Lucky Strike cigarette, her lipstick leaving Lucille Ball-red half moons on the end. “Davis,” as she liked to call me, “Davis, you can say my French stuffing is Portuguese until the cows come home, but it just ain’t true.” And while I know that they’re different but strikingly similar, I would tease, cajole, and argue, because in our family, that was the price of admission to our carnival. Though gravy is considered a requisite side for turkey here in the states, it’s relatively unheard of in Portugal—although in David’s family it’s reserved as a right that’s occasionally exercised. It’s not that this turkey needs it, as this roast turns out remarkably moist and insanely delectable. But the entire experience is all the better if you can muster a splash of stock, a little flour, and some arm power. 1. Position a rack in the bottom of the oven and crank up the heat to 425°F (218°C). 2. Remove any pin feathers from the turkey and pat the bird dry with paper towels. Rub the cavity with a wedge of orange and of lemon, season well with salt and pepper, and stuff with the remaining wedges and the bay leaves. Tuck the wing tips under the bird and tie the legs together. Mix together the melted butter, paprika, 1½ teaspoons salt, and 1 teaspoon pepper and brush about half of it over the turkey. Place the bird breast side down on a V-rack set in a roasting pan. 3. 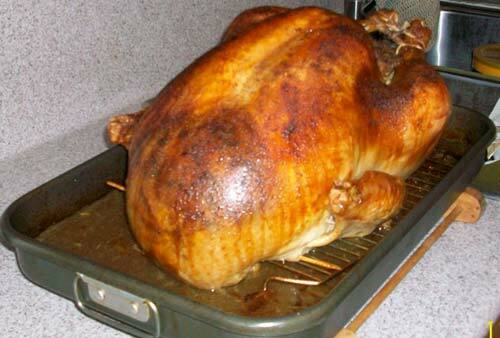 Slip the turkey into the oven, pour 2 cups of water into the pan, and roast for 30 minutes. Lower the heat to 350°F (176°C), flip the bird breast side up, and brush with some of the remaining butter-paprika mixture. 4. Continue roasting and brushing the turkey every 30 minutes, until an instant-read thermometer inserted into the thickest part of the thigh registers 165°F (74°C), 1 1/2 to 2 hours more. Tent the bird with foil if browning too quickly. 5. Transfer the turkey to a serving platter and let stand, tented, for 20 minutes. Although it’s not the custom in Portugal, you can make gravy (see Variação, below). 6. Meanwhile, plonk the potatoes into a large pot of cold water. Add 1 tablespoon salt, cover, and bring to a boil over high heat. Cook until tender, 10 to 15 minutes. Drain the potatoes in a colander, return half to the pot, and mash well. Set the rest aside and keep warm. 7. Heat the butter in a medium skillet over medium-high heat until the foaming subsides. Crumble in the ground sausage and cook, breaking up the clumps, until well browned, 10 to 12 minutes. Using a slotted spoon, scoop the sausage into the pot with the mashed potatoes. Lower the heat to medium and, if the skillet is dry, add a bit more butter. Drop in the onion and cook, stirring occasionally, until golden, about 12 minutes. Scrape in the garlic and cook for 1 minute more. Add the chopped reserved liver and sauté until browned, about 3 minutes. Scoop the mixture into the pot with the mashed potatoes. 8. Whisk the yolks and milk into the potatoes until smooth; if the dressing is too thick, whisk in more milk. Place the pot over medium heat and stir to cook the yolks, about 3 minutes. Fold in the reserved potatoes, sprinkle in the nutmeg and parsley, and season well with salt and pepper to taste. Keep warm. 9. Heat a Dutch oven over medium-low heat. Add the bacon and cook, stirring often, until the fat has rendered and the meaty bits are crisp, 12 to 15 minutes. Using a slotted spoon, transfer to paper towels. Pour off all but a thin film of fat from the pot into a cup and reserve. Bump up the heat to medium-high, add the chourico, and cook, stirring often, until lightly browned, about 7 minutes. Using a slotted spoon, transfer the sausage to a bowl. Pour off all but 2 tablespoons of fat, adding it to the bacon fat. If the pan is dry, add 2 tablespoons of oil. 10. Lower the heat to medium, add the onions, and cook until soft, 7 to 10 minutes. Add the garlic and pepper flakes and cook for 1 minute more. Splash in the wine, add the red pepper paste and tomato paste, scrape up any stuck-on bits, then let burble for a few minutes to cook the mixture. 11. Turn the heat to low, add the bread and the reserved bacon and chourico fats, and pour in just enough of the stock-water combination, beating well with a spoon, to make the mixture moist. If you use all the liquid and the pot is still dry, add water as necessary. Fold in the bacon and chourico and continue beating to lighten the mixture. Take a taste and season with salt and pepper if needed. Scoop the dressing into a bowl and speckle with the parsley. 12. To serve, plate the turkey, scoop the dressings into decorative bowls, and take everything to the table pronto. To make gravy, spoon the fat from the roasting pan. Set the pan over two burners and pour in enough homemade chicken stock or store-bought low sodium broth to the pan juices to equal 3 cups. Bring the liquid to a boil over medium-high heat, scraping the bottom to loosen any browned bits. Blend together 1/4 cup softened unsalted butter and 1/4 cup all-purpose flour in a small bowl to form a smooth paste. Scoop the paste into the stock, whisking constantly, until the gravy thickens and no floury taste remains, 5 to 10 minutes. Strain and season with salt and pepper to taste. Portuguese Turkey with Two Stuffings Recipe © 2009 David Leite. Photo © 2009 Holly Jennings. All rights reserved. All recipes and photos used with permission of the publisher. Ahh David, such familiar memories for me…. I too love the traditional Portuguese flavors at Thanksgiving–I am 50/50 French/ Portuguese growing up in New Bedford–but my Ma’s side of the family just cranked out the gortons as well as the tourtieres–I could never decide which I like better – so I ate them all! Lucky you, Lisa. We never got the torchieres. #envious! My “French” grandmother always made the sausage stuffing and my other grandmother made the bread stuffing. We’d sit at the table and both would glare waiting to see whose stuffing got taken first. Wow, it wasn’t just us, then! Sometimes you don’t realize that your experience is the farthest thing from unique until you hear from others. So, I’m dying to know: Which dressing did you dive for first? Dear God, what’s next, apologizing whenever the words “woman” and “kitchen” are in the same sentence? I am a woman and I think that no matter what I do, sweeping the floors or making million dollar deals, culturally it is my role to keep the family around the hearth. I find it more demeaning not being able to tell a broom from a ladle. Ha!! Well put, m’lady. And something I agree with wholeheartedly. It was more about how all the women and girls fluttered around while the men and boys simply sat there princely. Then after the meal, never a male would lift a finger to help clear or clean. It was off to the den to watch whatever game was on TV with hand firmly shoved into pants, calling out for a beer, which was delivered to them–opened. Being the first generation here in the States, I fully learned to embrace the Thanksgiving tradition first by using my mother-in-law’s recipes, then by researching the true first Thanksgiving meal (where it seemed there were no turkeys; yes I went all the way to Plymouth, MA and learnt all about it). Then I finally decided to start adding my Portuguese touch to the dressing, which oddly enough is quite a bit different (learnt it from my GrandMother), where we would use three-day old peasant bread broken into pieces and soaked in 50/50 red and port wine then adding the traditional Portuguese tastes (onion, garlic, olive oil, gizzards and liver, presunto, chouriço, cilantro, parsley and piri-piri). Funny how through all generations, wether you are a 2nd, 3rd or 1st generations, some things always stay with you no matter where life takes you! Loved this piece David as all others, just thankful I read it first thing in the morning rather than after a few wine glasses at night. I would have had trouble following you, but that is the charm of your writing! I love how different your dressing is from ours. Tell me, is the dressing based upon anything in Portugal? My grandmother’s dressing is similar to some migas I had while traveling through the Alentejo. David, I have absolutely no idea as my Grandmother was known to create her own recipes. It certainly had a Portuguese flair to it, but nothing close to what I ate at other peoples’ homes. Thankfully she wrote down everything she would make hence the reason I have all of her recipes to keep some of her traditions. I can tell you though, it seemed she loved incorporating booze to just about everything she created! Ha! Oh, those Portuguese cooks! Thanks for bringing back such great memories of our childhood holidays. I totally agree with you on how my mother would have reacted to your telling her that her French stuffing was not all that French! She would give you hell, most likely a slap to the head and then a hug. Everyone, this is my kid cousin Wayne. He was usually the one who broke immediate family rank and reached for another aunt’s food. And, Wayne, what I wouldn’t give to sit down with your mom–and all of the family–just one more time. All these recipes sound wonderful! Being in a Portuguese family in Hawaii and my grandparents coming from Madeira, I wonder if the bread stuffings vary from each island or mainland Portugal. My Avo’s was day old bread with tons of parsley, green onions, liver, bacon and chicken stock but I don’t remember anymore than that other than salt and pepper and no hot stuff or tomato anything. If anyone remembers this bread stuffing and has this recipe, I would be so happy if you would share it with me. A very Happy Thanksgiving to all of my people! Mo, your grandmother’s version sounds wonderful. But there was no sausage in there? Or pork? Was the liver from the turkey? What color was the dressing? All this might help people narrow down the possibilities. And Happy Thanksgiving to you, too! There was definitely turkey or chicken livers in this stuffing and I do remember lots of parsley and green onions, bacon, probably garlic too, with broth and crusty bread, but beyond me this recipe was lost and I deeply regret it. The color was a whitish-grayish, with lots of green minced stuff and my God was this delicious! I do not remember any hot pepper or sausage but I was little also. It didn’t appear to have tomato paste either. Actually the color wasn’t so hot looking for appetizing but the taste was to die for. I am sure these stuffings vary by families and locales. Many years later I heard from an Auntie in California as she had found a book that stated a lot of people migrated from Israel to settle in the islands-Madeira and San Miguel, and beyond, to get away from religious/racial persecution, and adopted the language, religion and customs of the Portuguese. I do hear about using Kosher salt and brining a lot and that makes me wonder. It would would be a great thing if we could find out the truth behind this. Whatever!!! I still feel like I am Portuguese! I have the almond eyes and also the olive complexion!!! Hi Mo, here’s the recipe that my family uses: 1 yellow onion, 1 green onion, olive oil, garlic cloves, chicken/turkey gizzards, 1 bag of Pepperidge Farm herb seasoning bread, 1 lb ground turkey, 1 lb ground pork (you can use ground beef but it gets too dark), 1 pound Jimmy Dean sausage, salt, black pepper, fresh parsley leaves, beef broth and you can use the water from when you boil the gizzards. I follow the instructions David mentions above using my family ingredients. I do love the bread and wine idea from Sofia above, I may try it one day. This is very similar to David’s recipe but we don’t use any tomato sauce. I may also try it with the bacon, sounds delicious. In the meantime, I’m using my family’s recipe. I celebrate it with my husband’s family, and they are 3rd generation French/Portuguese so they do have their french stuffing but I usually cook my chouriço stuffing and bring a side dish as I can’t celebrate Thanksgiving without it….. HAPPY THANKSGIVING! Sounds lovely, Rosa. It’s so interesting to see the differences and similarities between our families’ dressings (nee stuffings). 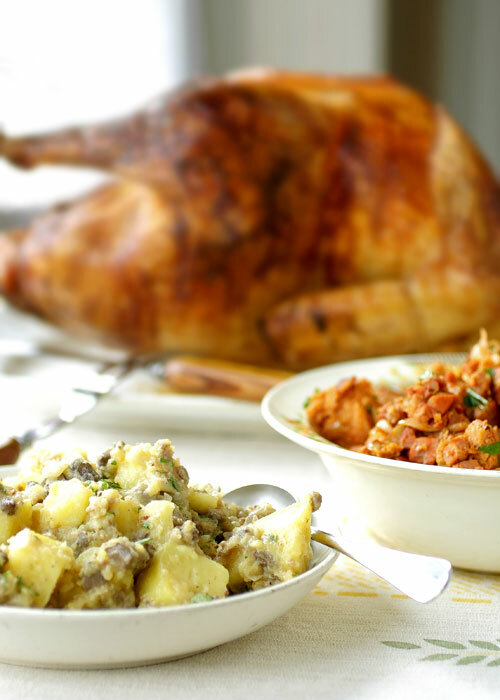 And I agree with you: It just just ain’t Thanksgiving without Portuguese stuffing. Happy Turkey to you all. Thanks so much for the recipe, Rosa! I truly appreciate your taking the time to type this out and send it in! I do know the bacon really adds to the flavor. I wonder if the tomato paste wasn’t to improve the color and acidify the dressing just a bit? I know I add just a touch to beef stock and to stuffing (as opposed to dressing) sometimes as I had been directed by my mother-in-law. I have noticed some stuffings appear sort of an ash blonde once removed from the bird. They taste fine, but aren’t very appetizing to look at. I grew up with oyster stuffing, a Maryland tradition, I think. I thought it was ugly and gross and wouldn’t touch it. I still haven’t tried it. Susan, my mom says that my grandmother would sometimes add paprika for color (My grandmother would put paprika in and on everything!) and that the tomato paste is for taste–both acid and sweetness. I can’t speak to the oyster stuffings in your family, but I made one a few years ago, and I banged my chin on the table when I fell off my chair. It was that good. This is all too familiar (both in the similar and familial sense) to what used to happen during Christmas Eve dinners of yore with my mother’s extended family. Mum is one of 10 siblings; we are 16 cousins. There was always much shouted conversation, happy confusion and general mayhem with up to 40 people at these dinners. The siblings would take turns every year to host the dinners, but everyone brought something to the table (the table would be two or three lined up end to end) … including three different stuffings/dressings from two sisters (Mum being one of the two) and a brother – all fiercely proud cooks. “Girl, have you had my stuffing yet?” would be the annual inevitable question from Aunt Maureen – whose stuffing was a Chinese riff on chestnut, sausage and mushroom – Chinese preserved sausage (lap cheong), dried shiitake mushrooms, chestnuts, rice wine, soy sauce. God help me, I could never swallow more than one spoon of Aunt Maureen’s stuffing. Ling, it was now my time to laugh so hard I snorted. This was hysterical. We all have an Aunt Maureen, don’t we? Mine shall remain nameless…Aunt Florie. Oops. Hi, David! My ávo was born in Waialua, Oahu, Hawaii in 1884. She did this for all her children at all holidays. She had five boys and three girls. Three did not make it. I’m going pass on the Portuguese stuffing recipe. John, thank you for both the stuffing recipe and the picture of the bird. They look wonderful. I hope this encourages more people of Portuguese descent to send in their Thanksgiving (and Christmas!) stuffing recipes. Hi! David, thanks so much.. You just don’t know how I’m thankful. My ávo was Mrs. Philpmena C. Cazinha. She was the Best. It’s her and my mom, Mrs. Madeline C. Peru, that I got to cook. They never said a bad word about cooking, they just knew what to cook and just cooked their hearts out. Every Day. She did so much that’s my mom they all called her Aunty Lana…short for Madeline. John M. Peru: They called me, Johnny Boy! My pleasure. Thank YOU, John. I mean Johnny Boy. Hi David, It’s funny when a stranger is writing about your own family… I think those stories exists anywhere on the globe but it’s always nice to read them. The part about the Kosher turkey caught my eye; there are many Portuguese Christians families who have in fact Jewish roots, they are “Converso.” It’s known that most of them consider themselves as Christians today, but are still practicing for hundreds of years, the same Jewish customs of their ancestors in food, cooking etc. Back to the bird…. You wrote: “The benefit…is a bird that’s juicy and richly flavorful.” Since I’m using the Kashrut rules, it’s known that meats are more tender and moist if you don’t put salt on them, because the salting dries them. We are allowed to skip the salting if we put meats on an open fire or grill. This way you get it juicy and tender, better than after the salting procedure. Abigail, thanks for writing. I’m quite aware of the Conversos. There’s a theory floating around that Portuguese folks with an object (noun) last name are actually Jews who converted to avoid persecution. For example, my last name means milk. Most of the Portuguese I grew up with–Dias (day), Oliveira (olive tree), Carvalho (horse), Flores (flowers), etc.–are possibly of Jewish heritage. Regarding my grandmother’s (and others’) pre-salting of meats, there seems to be a huge schism in the food/chef world on the topic. Some are for, others are vehemently against. Harold McGee, the dean of food science, is in favor of pre-salting because he says although there’s some superficial loss of moisture, the salting traps water within the cells. The net result is a tastier and moister bird. I’ll look for exactly what he says, if you’d like. Johnny Boy’s stuffing comes very, very close to my Avo’s and I am thrilled to have written it down! The only thing i don’t get is frying the stuffing? My Avo used to put it in the turkey and any left over was put into a baking dish. I would like to know how this stuffing could be fried and then what, put it into the turkey afterward? I don’t remember this process but as I said, I was really little. Thanks so much, it is a pleasure to finally be connected back with my people! Hi, David. My Ávo and mom always made a turkey for Thanksgiving, although they never ate turkey growing up in Portugal because it was expensive. My Ávo would make an all-meat stuffing and STUFF it in the bird, then cook it. She would save up scraps of meat and freeze them, then pull them out for the big day and put them through a meat grinder. It was like a croquette but made into stuffing. I also remember alot of lemon–both in the stuffing and in the gravy. It was the BEST stuffing. What I wouldn’t give to have a taste of that meat stuffing again! Susanne, that sounds maravilhoso. Tell me: Was there any potato in the stuffing? Happy Thanksgiving to all! I love stories like this, family and cultural tales behind the history of dishes and mealtime traditions. Sadly, we sat down to the same American Thansgiving meal year after year of turkey with Pepperidge Farm stuffing, sweet potato casserole made with orange juice and tiny marshmallows… no stories and even very few memories it was so bland. Maybe that is why I love other people’s stories so much. Jamie, do you try to celebrate it in France for your kids, or does the holiday not mean much to them? David, we never celebrated it here in France. In France we go French all the way, in the US we do American. But oddly enough, this year my older son asked if I would cook a Thanksgiving meal. He asked the day after the holiday and he is still waiting so I may do it next week. But they feel no connection to the whole T Day story and pilgrim thing. Well that’s an arrangement I think the United Nations would be quite pleased with. When in Rome….., I guess. It makes a very rich and spicy side for a change. I made dressing for a goose once (someone else was cooking the goose) and did the oysters, sausage and some chopped up prunes. Great with that stronger flavored meat. Oh Ruthie, I love oyster dressing, and sausage dressing – to be perfectly honest, all almost dressings. Hurry up Thanksgiving! This is one of the juiciest and most flavorful turkeys I’ve ever had. This year David brined the bird in a salt, brown sugar, lemon, and orange brine. As a cook who always brines chickens for at least 12, and up to 24, hours, I was surprised that he achieved the same result (and maybe, just maybe better) with a bigger bird that was brined for only 8 hours. Although you won’t get an overwhelming citrus flavor, whatever happened in the big enamel pot worked deliciously. The dressing. I just love Vo Costa’s dressing. 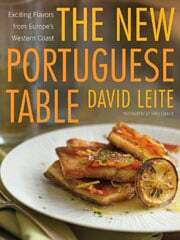 It has that authentic Portuguese flavor of some of the best dishes Mamma Leite makes. Um, excuse me, love? But “just maybe”? I think my turkeys were head and shoulders (or rather neck and waddle) above your chicken. Take heed, little man, and you will become a much better cook. Take heed. Don’t you love the way holidays bring families together and loved ones closer? LOL! I brined a duck with a sugar-salt brine with Lapsang Souchong tea in it once. I wanted to do the slow roast, skin basting kind of treatment like Peking Duck, but in my oven. It came out pretty good — the flesh had a little halo of darker color near the skin from the tea and just a hint of smokiness. I might try that again with more tea next time. I was afraid to make it too smokey for a first try. I don’t think I’d use it for any bird that didn’t have all that fat under it’s skin, though, might really overwhelm the flavors of a chicken, for example…although a turkey just might do it. Can you imagine all that gorgeous turkey skin crackling with flavor and crispness??? And, er, David…it’s “wattle.” ;) Once an editor, always an editor. Ruthie, that sounds delectably delicious! And, [shakes fist at the heavens] “Damn spellcheck!” Wattle it is. Ah, the ghost of spellchecks past. ;) Sometimes their changes are hysterically funny, and sometimes they’re just wrong. I used to swear I was going to keep track of some of the funnier ones and publish a book. At least waddle could have something to do with a bird. Heh. And what’s worse, I think I used the dictation program on my Mac, so it might have heard wattle but wrote waddle. And I was none the wiser because I never see my typos. Just ask Renee…. Ruthie, gangs rioting. Hysterical. The new Mac dictation is really good, but Siri has learned my voice over these past two years, so maybe that’s why. I was searching the internet for my mother’s Portuguese inspired chourico stuffing recipe. The twist I don’t see here is that she actually put the stuffing inside the turkey cavity while roasting the bird. Oh my, did it come out nice, moist, and flavorful. Can I place this bread/chourico stuffing inside the bird to cook together?? Thank you so much. David, you absolutely can. Just please make sure to check the temperature. It should be 165 degrees. That way it’s safe to eat.